Making their home in a bleak and sinister cave, the Krampus spends the year waiting for their opportunity to venture out and take more captives from those children who lack the festive spirit. Served by a small group of goblins who live in the ruins outside, Krampus takes great pleasure in the torment of his prisoners. 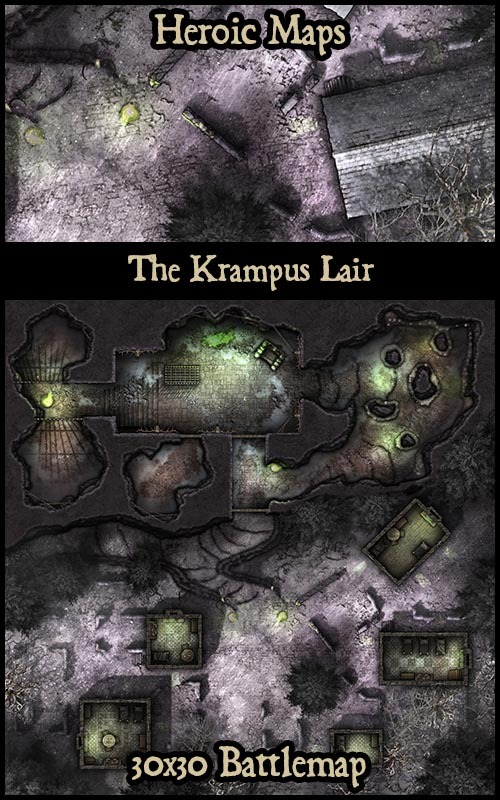 Contents: A 30 x 30 map depicting the winter lair of Krampus. A small village of evil Christmas goblins is built amongst ruins, blasted by a blizzard and covered in snow. A cave and ruin have been turned into the lair for Krampus, with caverns filled with snow-globes and cold dark prison cells.